Do you enjoy arcade first-person shooters where you’re locked to one position, and must defend yourself from 360 degrees of assault? If so, welcome to a niche club! Also, developer/publisher Mastiff has released just the game for you—Heavy Fire: Red Shadow. Is this a fast-paced shooter worthy of your time and money? Find out in our Heavy Fire: Red Shadow PS4 review. Anyone remember the Beach Head arcade game? Specifically, Beach Head 2002? This arcade machine featured a yellow pull-down VR screen, which had triggers attached to it. The player was allowed standing room, to turn a full 360 degrees and attack enemies who could approach from any direction. This was impressive tech back when it released in 2001, and Mastiff attempted to capture some of that arcade appeal, here in PSVR form. Sadly, it must be reported that this isn’t the case with Heavy Fire. The Unreal Engine is used for Heavy Fire. This engine is geared towards high-resolution assets, and high performance. Yet you wouldn’t know that looking at Heavy Fire. Graphics are almost always scaled back for virtual reality, but the assets in this game look ripped straight out of the PS2. The L2 button is supposed to provide a zoomed-in view, but all it seems to do is add the slightest bit of detail to the ground and foliage textures. This may be the worst-looking game on the PS4 (at least since Yorbie), and if not, it is a contender for the worst-looking PSVR game. One small silver lining is that the PSVR headset’s surround sound still works, so helicopters flying overhead at least sounds nifty, and it’s easy to tell which direction incoming attacks are coming from. A separate mode to enable VR is available, for an additional $9.99, though this was included for free with digital pre-orders, and is included in the physical edition of the game at Walmart. This sounds like a no-brainer. A first-person shooter where the player is in a rotating machine gun for the duration of the battle should be an easy fit for virtual reality. Problem is, Heavy Fire’s VR implementation simply puts the player inside the game, while the controls do not change at all. Most first-person VR games where the player is locked in position (like a tank or flight combat game) allow the player’s gaze to control the reticle, both because it feels natural and enables higher accuracy than could ever be achieved with the right analog stick. Heavy Fire doesn’t do this, and the player is forced to use the left analog stick to move the view, and the right stick to shift the reticle slightly. Looking around only allows the player to spot enemies more quickly than panning with the left stick. It’s frustrating when having the reticle react to the player, as well as rotating the view, would’ve resulted in an instantly better experience. Not that accuracy really matters here. Enemies go down exceedingly easily, and bullets that the player fires seem to have a very large hitbox surrounding them, meaning that firing within the general vicinity of an enemy is all but guaranteed to hit them. All enemies are also conveniently highlighted with markers right above them, which will be colored green, yellow, or red depending on if the enemy is far away, getting ready to fire, or actively shooting at the player, respectively. This status is also shown in a direction indicator that encircles the reticle, so there are no real surprises as to where damage is coming from. There is an attempt to tell a story in Heavy Fire’s short campaign. It’s about North Korea attacking the United States and allies, and is told through one narrator’s voice as he talks over a generic map that shows footage of missile launches, protests, and the usual chaos that surrounds world military action. The story is generic, and the budget used to produce these videos could’ve been better spent on beefing up the campaign itself. 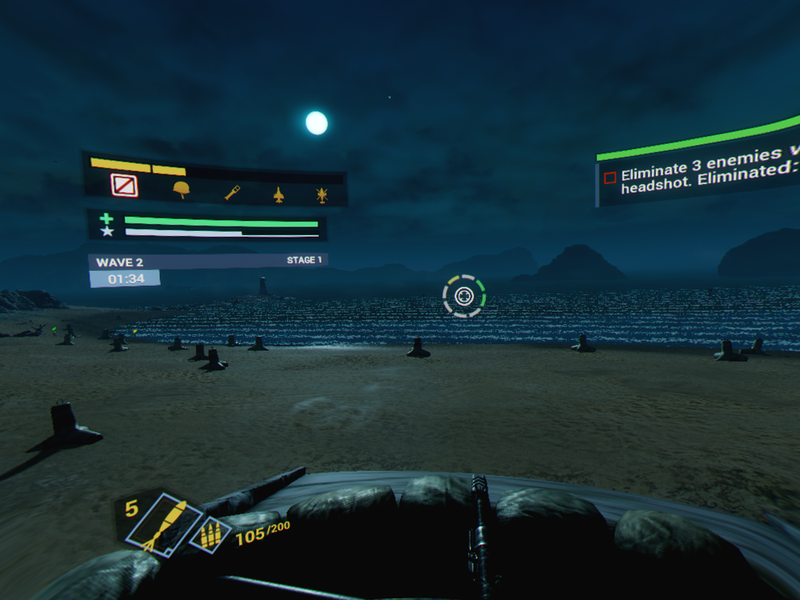 There are only eight stages in the campaign, which take place on four maps—first, you play the map in the day time, and then you follow that up with a night mode of the exact same map. Given that this is in the Unreal Engine, that means Mastiff may have simply moved the position of the level’s sun to make a “new” stage. At any rate, each stage only takes 10-15 minutes to complete, depending on if enemies get stuck behind the scenery, out of view for a while, and thus unkillable. As the player kills enemies, experience points are earned. Enough experience points will unlock a skill point, which can be used to upgrade weaponry. After just a few upgrades, the player becomes so powerful that most waves are hardly a challenge. There is also a quicker-filling experience bar that unlocks support options, from ammo and health crate drops, to infantry units which take care of ground troops, as well as artillery strikes, jet fighter strikes, and attack helicopter strikes. The artillery and jet strikes will kill your own soldiers, as there is no mechanism to choose where these strikes will land, in another frustrating design decision which probably wasn’t tested very well, if at all. These support options are offered so often from just a handful of kills, that before long half of the area in front of the player can end up filled with supply crates and infantry. Once the roughly two-hour campaign is finished, an endless mode featuring a leaderboard becomes available. Since the game is so easy, ranking up on this leaderboard is a test of endurance more than anything. After almost two hours, I had ranked up to 3rd place, presumably globally. But it was getting late, so I chose to exit this mode. This caused my score to not submit to the leaderboard, and my two hours felt like even more wasted time. Also, after destroying so many vehicles, especially pontoons in the sea on the beach stage I had chosen, the game began to break down in peculiar ways. Vehicles began to randomly float across the battlefield, becoming even easier targets in the process. Destroying a vehicle that was still on the ground caused it to no longer obey the rules of gravity, resulting in some hilarious glitches. Finally, all other objects and enemies began to move very slowly, making kills somehow even easier than before. This issue was likely due to a lack of optimization from Mastiff, as vehicles didn’t seem to remove themselves from the game once destroyed, thus cluttering up the game’s memory usage to the point that it started affecting physics calculations. 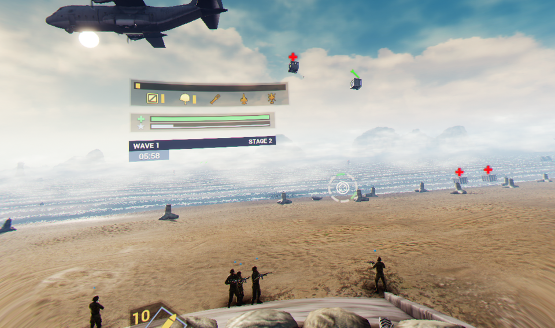 Heavy Fire: Red Shadow had the potential to give gamers an updated version of Beach Head 2002 from the heyday of arcades. Unfortunately, an incredibly short campaign, terrible graphics, and a lack of any real challenge all coalesce into an altogether underwhelming product. The $9.99 premium VR mode is so minimal in execution, that even that isn’t recommended. If you absolutely love arcade, wave-based shooters, it’s probably still best to wait until Heavy Fire: Red Shadow is on a fire sale before plopping down the cash. Heavy Fire: Red Shadow review code provided by publisher. Version 1.00 reviewed on a PS4 Pro. For more information on scoring please see our Review Policy. It's so easy, anyone can play. Surround sound helps to pinpoint attacks. It's so easy, there's no challenge. Appalling graphics, no real point to VR.